Located beneath the surface, the city of Rû shelter it’s citizens against the burning heat and desert storms that ravage the planet. The data structure at is center is still in active use, and remain quite the sight for newcomers. Blender, ZBrush, Photoshop, Substance Painter, CrazyBump & Unity. GRiZ - Summer '97 ft. Muzzy Bearr . Given my late attendance to the contest, it’s been a hectic two weeks taking the rough draft to a “finished” state. I’ve coded in Unity before, but never done any larger scale environment. Learning Blender as part of the challenge have been a fun experience, and will no doubt be part of the toolkit moving forward. A thanks to all the people partaking this challenge, be it viewer, creator or both. And to Unity. Made some highpoly models at lightning speed and baked them down. Didn't think I'd have time for it... perhaps I don't... i mean didn't... =D anyway cheers! Started to textures some of the close-range geometry. Still figuring out exactly how I want, and its far from done. That said, I do see a glimmer of hope for finishing this in time. I do however need to spend part of Sunday making animations and the required movie, so it'll be really tight. So ya, still got quite a lot of work to do. Gonna be a busy weekend =D. Feels like the more I work on this, the more I have to do =D. I've been blocking out a rough Idea for the platform which I should be able to finalize today. Here's a few snapshots from Blender. So, the central building is now sculpted, baked and textured. Keep flipping between the color used within the structure, kinda like all of them xD. Here's some images of the Zbrush model and some renders in Substance. Still prototyping. Made some rocks/cliffs in ZBrush and did a quick texture pass in Substance Painter, will most likely shuffle them around and make more for variation. I kinda like the look of tech nested within a crumbling rock, so I did a quick animated shader in Amplify. Fractured the model I had in Blender and will likely run it though Zbrush and SP for the final bake. 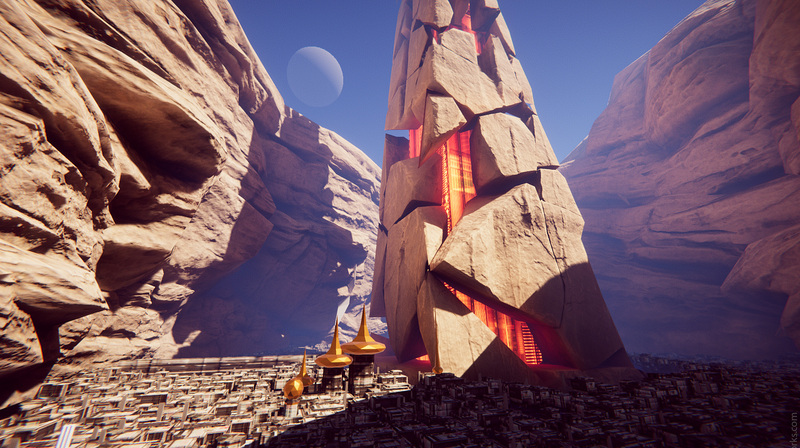 Environment features a desert"ish" city, build beneath the rock with a central monument at its heart. The overall structure of the city is done but everything else is still up for grabs. As for the monument. Central processing unit? Humidity extracting device? Let’s find out! Joining this quite late with less than two weeks left, but I should have some time off this weekend. Few images of the block out below.